Was there an orchestrated campaign between government and media entities to see George Zimmerman imprisoned, or even executed? During the trial, presumably reputable news sources presented a narrative that was sold to the world as news: an innocent “black child” gunned down by a crazy “white man” while on a routine walk home. On 14 July, in Florida, George Zimmerman was acquitted of murder charges in the shooting death of Trayvon Martin by a jury. If he had been convicted, the 29-year-old former neighborhood watch volunteer could have been sentenced to life in prison for second-degree murder or up to 30 years for manslaughter. In this racially charged and media manufactured case, a man charged with the crime of defending himself was publically tried, found guilty, and strung up by the media (figuratively). These two misleading pictures ran side by side almost everywhere. 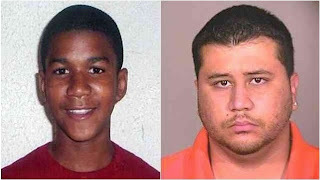 Why would the mainstream media choose to continue to show an old picture of 12 year old Trayvon – not 17 year old Trayvon? Could it be because the images help to cement in your mind the little, cute, youngster who was stalked by a monster? 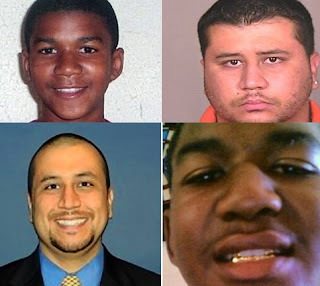 When in reality, the medical examiner’s report showed that at the time of his death Trayvon Martin stood at 5”11 tall – a full 4 inches taller than the 5”7 Zimmerman. What also wasn't reported by the mass media was that Trayvon Martin was a trained mixed martial artist fighter (otherwise known as a “cage-fighter”). And that at the time of the shooting Trayvon (who was several inches taller) was reportedly on top of Zimmerman throwing “mixed martial-arts style punches” and smashing his head into the concrete pavement. This accusation is backed-up by autopsy results that reveal Martin’s injured knuckles at the time of his death. 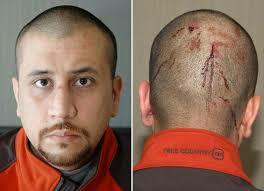 And it could have been this evidence that might be the reason why Zimmerman wasn’t charged immediately after the shooting. In fact, not only did local police not charge Zimmerman at first, but they also continued to refuse to charge him until the President and Attorney General of the United States brought overwhelming political pressure onto the office of the local police chief. Additionally, Trayvon’s autopsy report revealed that he had a form of liver damage that was common among users of an underground “home-made” drug called “lean”. Ingredients for making the drug “lean” was found at the crime scene and police confirmed it had been purchased by Trayvon earlier that evening from a local 7-Eleven convenience store. The importance of this key piece of unreported information is that the psychological effects associated with lean are “extreme physical aggression” and “paranoia”. What’s even more unusual is that the jury was not allowed to know about the drug “lean” and Trayvon’s potential altered mental state and violent tendencies at the time of the altercation with Zimmerman. Another crucial factor of information that was kept from the public was Trayvon Martin’s Twitter page, which featured the teen tweeting unusually aggressive profanities. To some, these behaviors are an indication that Trayvon Martin was something other than the mass media’s portrayal of him as an “innocent teenage boy” who was shot while walking home. Unfortunately, we are not taught to be thinkers, but reflectors of our culture. Our culture has accepted two huge lies: The first is that if you disagree with someone's lifestyle, you must fear or hate them. The second is that to love someone means you agree with everything they believe or do. The foundation of that control has always been the same: keep the people in ignorance, fear and at war with themselves. Divide, rule and conquer while keeping the most important knowledge to yourself.